WHAT IS HYDROTHERAPY AND WHAT CAN IT PROVIDE US? Aquatic therapy or hydrotherapy is a treatment method used by physiotherapy that offers innumerable benefits to different pathologies of the locomotor system. Much is said about hydrotherapy and its benefits, but in this article we will speak more deeply about the aspects that make aquatic therapy an ideal tool for the treatment of musculoskeletal disorders. What is hydrotherapy or aquatic therapy? 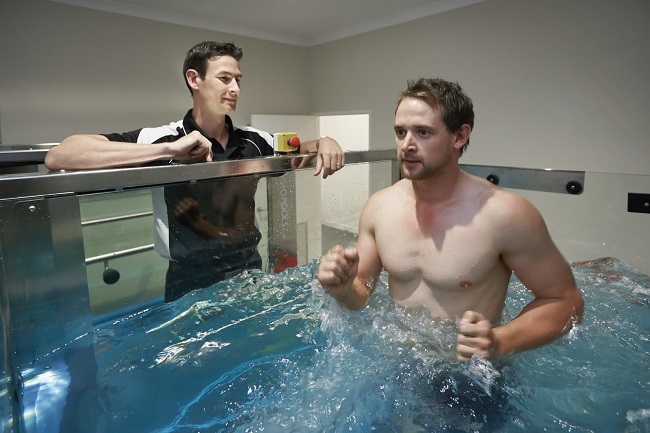 Hydrotherapy or aquatic therapy is a therapeutic method in which physiotherapeutic knowledge of rehabilitation and biomechanics are used in conjunction with various treatment techniques that take full advantage of the properties and benefits offered by the aquatic environment. The sessions of hydrotherapy or aquatic therapy will be performed according to the needs that must be covered in a personalized way for each patient after their evaluation, since as any rehabilitation process is not a generalized technique, but must adapt to the person, Pathology and symptomatology. It is important to understand that hydrotherapy is a complement to the rehabilitation process, so that, besides the aquatic environment, more techniques can also be used to achieve better treatment efficiency. What are the bases or basics of hydrotherapy? The hydrotherapy complies with certain foundations or scientific bases that make it be considered a magnificent method of treatment or rehabilitation. In addition they allow us to understand much better the action that has the water in this process. Archimedes’ principle states that “a body submerged in liquid undergoes a vertical upward thrust equal to the weight of the fluid that it dislodges”, which consequently causes the person’s body weight to decrease to 90% of its original weight, favoring Performing rehabilitation exercises and reducing their impact on joints. According to the friction force principle, it is stated that “the movement of a body submerged in liquid will depend on its size and speed since the friction of the water will be greater if the size and speed increase.” This principle explains why the water favors the strengthening of the musculature. Hydrostatic pressure is “the pressure exerted by a liquid on a submerged body”. Due to this pressure, the thoracic perimeter decreases (1-1.35cm) and the abdominal is shortened (2.5-6.5) favoring the rise of the diaphragm and facilitating the work of the expiratory muscles. Thanks to the excellent capacity of heat conduction of the water and absorption, we generate a final stimulation that conjugated with the frictions, massages, and brushes that are achieved in the water, produce a vasodilation that favors the blood circulation. Once we have known the scientific basis for the application of hydrotherapy as an excellent tool or method of treatment in the rehabilitation process, it is easy to deduce the numerous benefits that derive from aquatic therapy. It produces a relaxation effect on the muscles and even a mental relaxation of the patient. It produces an analgesic effect thanks to vasodilation and the relaxation effect. It contributes to improving the immune system. Reduces the impact of joint movements. It favors balance and proprioception. It facilitates the movements and also allows reaching greater rank in them. It decreases the patient’s feeling of fear and anxiety toward therapy. Swimming and hydrotherapy should not be confused since they have purposes and above all completely different physical demands. The swimming to be a sports discipline, it requires of greater physical effort, it seeks to increase and to enhance the physical capacities of the person from a more sportive aspect and of competition, it requires preparation and physical demands specific to a sport discipline. On the other hand, aquatic therapy will be more aimed at recovering the functional capacity of the affected area of the patient, restoring skills, maintaining or preserving mobility, preventing sequelae, reducing pain, etc. That is, it will be clearly oriented towards the rehabilitation of the patient. Once you know the basics and basics of hydrotherapy, its benefits, and its many indications, there is no doubt that it is an ideal method to complement the protocol of treatment of patients and obtain better and more successful results. 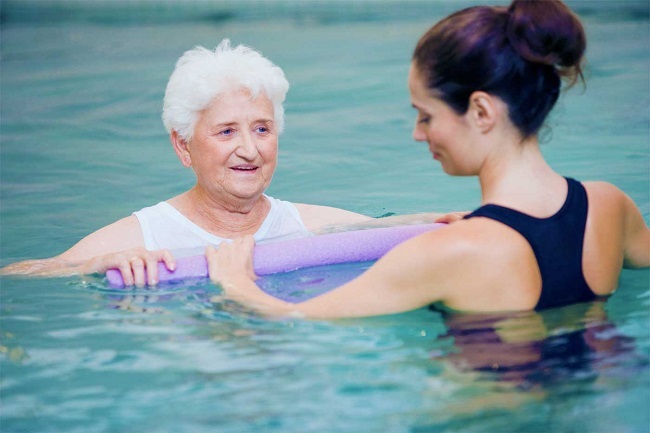 Aquatic therapy is an excellent treatment option for physiotherapists, allowing us to reach from a more psychological point of view, the patient’s confidence in the treatment and its recovery. The fact that a patient can in the water take the steps that he can not give out of it, is a motivational factor to persevere in the process of rehabilitation, to continue with it and seek to win. A patient who can move within the water without feeling pain will associate the moment of the aquatic therapy with a pleasant moment will maintain a more positive attitude to his condition and his body will consequently respond to this with a much more satisfactory and effective rehabilitation process . That is why we invite you to expand your range of techniques, methods or tools that you use in the day to day with your patients to obtain more and better results.